Are you keen to learn about a fresh perspective to dealing with risk? Are you sick of attending conferences that that are full of regulators, lawyers, bureaucrats and fear centred safety? Then set these dates aside! There has been nothing like this conference before. 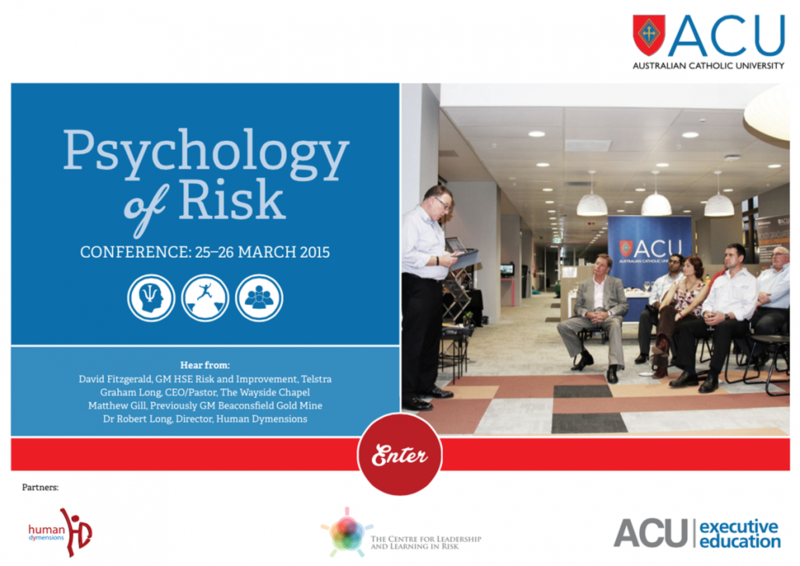 ACU, Human Dymensions and the Centre for Leadership and Learning in Risk are sponsoring the first Psychology of Risk Conference in Australia. The conference will be held at The Australian Catholic University in North Sydney on 25, 26 March 2015. Keynote presenters include: David Fitzgerald – Telstra; Graham Long – The Wayside Chapel; Matthew Gill – Former General Manager Beaconsfield and Rob Long – ACU. 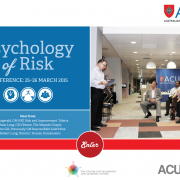 In addition, more than 20 practitioners from the field will be presenting workshops (in concurrent format) on the application of psychology of risk principles to the workplace. Rob Sams will be presenting at the Conference talking on the topic ‘What is excessive regulation doing to us all? Would you like a chance to win a ticket to the Conference? Dolphyn is offering one person a chance to attend the conference on us! All you need to do is write a short 300-500 word article on the above topic (or generally about how you feel legislation impacts on how we go about risk and safety) and send it in to contact@dolphyn.com.au by 16 January 2015. Rob Sams will read through all of the entries and choose a winner that will be published on the Safetyrisk.net Blog. Writing is a great way to collate your thinking, and publishing your article on Safetyrisk.net Blog means that you will join a band of great thinkers in risk and safety. We are looking forward to reading your entry. Good luck! Newsletter #1 – December 2014 Who Decides What is Ugly?